Only two more weekends for this year’s New Albany Farmer’s Market; Kenny is doing his best to keep the fresh veggies coming. It’s been a difficult task this year, last weeks cold snap was painful to our gardens. We lost almost all our beans, most of the eggplants, peppers, cucumbers and squashes; but we will have some for this weekend. We will also have sweet potatoes, kennebec, and red potatoes, onions, fall/winter squashes (spaghetti, acorn, butternut, etc…). Tomatoes are still hanging in there, we should have plenty on Saturday. There is some good news… plenty of veggies really like the cold weather. We will have plenty of greens… Swiss Chard, kale, spinach and mustard. Lots of turnips, radishes, beets, kohlrabi, broccoli, cabbage, cauliflower and a huge harvest of carrots! 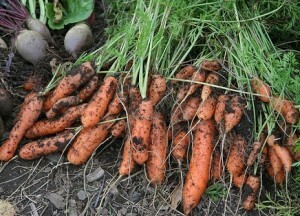 The deer ate most of the carrot tops so the harvest was quite surprising!